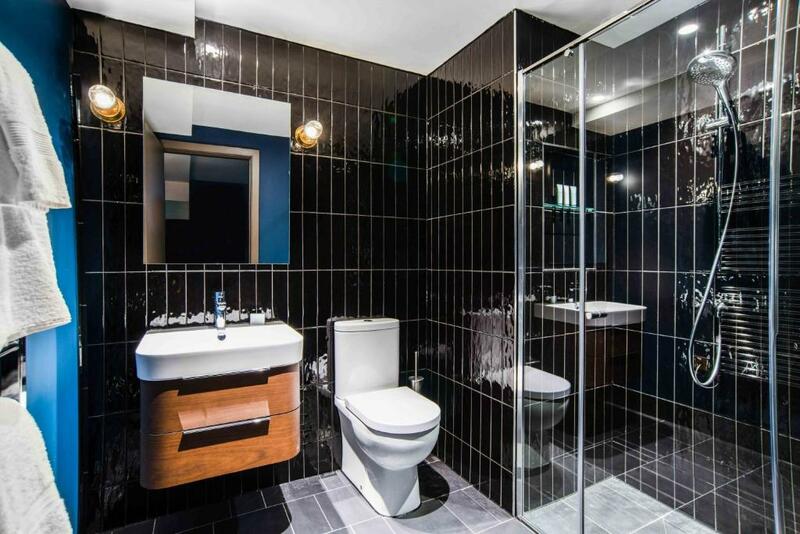 Lock in a great price for Native Manchester – rated 8.3 by recent guests! Native Manchester apartment hotel on Ducie Street is located in the center of the city in a former warehouse, featuring wide columns, wrought-iron girders and brick barreled ceilings. There are 166 apartments with 7 types to choose from, starting with a compact Studio to a spacious Penthouse Two Bed duplex apartment. While the premium options offer extra room and special perks, every apartment is surprisingly spacious with exposed brickwork, powder blue beams and golden lights. Each apartment comes with its own fully equipped kitchen and king-size beds. Many have loft-style ceilings with exposed beams, and some even connect to other apartments. Native Manchester is just 350 feet from Manchester Piccadilly Train Station, and Manchester Airport is 9.9 mi away. When would you like to stay at Native Manchester? This apartment features a soundproofing, seating area and flat-screen TV. This apartment features a soundproofing, kitchenware and oven. This apartment has a kitchenware, private entrance and dishwasher. This apartment features a microwave, view and air conditioning. This apartment features a private entrance, oven and microwave. Stay in our Grade II listed Ducie Street warehouse just a two-minute stroll from Manchester Piccadilly train station. Relax in one of our 166 luxury apartments starting from a cosy studio to a palatial two bedroom duplex penthouse apartment. With a restaurant, bar, café and fitness classes, you’d be forgiven for never leaving the building. Manchester is one of the UK’s proudest and most exciting cities, world renowned for its arts, sports and industrial history. Not to mention the culture and buzzing food scene, with its innumerable bars, restaurants, galleries and museums to explore. Football fans can find us a 6 minute taxi drive to the Etihad Stadium and 15 minutes to Old Trafford. Native Manchester is 2 minutes from Manchester Piccadilly station. House Rules Native Manchester takes special requests – add in the next step! Native Manchester accepts these cards and reserves the right to temporarily hold an amount prior to arrival. Payment for a nonrefundable reservation needs to be processed via an online payment link. Guests will receive an email direct from Native labeled, It s time to pay, within minutes of making the reservation. Within this email will be an option to open a secure payment page which is to be used to process payment for the reservation. Guests who have made a refundable booking will also receive this payment request email, however, the payment due date will be their day of arrival, therefore, they are more than welcome to make payment at the property upon check in if they do not wish to pre pay the reservation. Please Note: The housekeeping service is provided on a weekly basis. We do not accept cash payments. We have a strict no party policy. Extremely noisy due to the windows facing the atrium. Living room furniture could be a little more comfortable. Great location. Comfy beds. Nice kitchen. the bathroom to small. the flooring felt unclean.dirt under the chairs. the flooring needs replacing. Comfy bed, nice apartment and nice friendly staff. Lovely building beautiful apartment with good facilities.